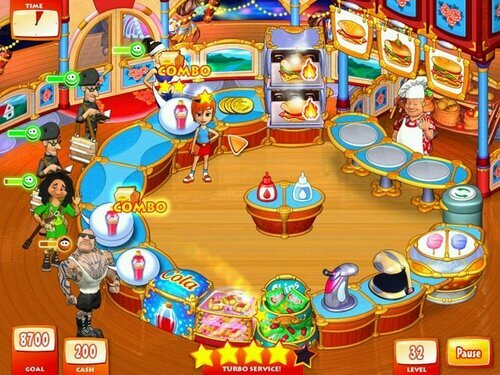 Snack pack of culinary quests – five games one download! Launch a pizza franchise with Turbo Pizza, open NYC sandwich shops in Turbo Subs, and take your fast food empire to outer space in Turbo Fiesta! Find hidden ingredients and whip up recipes in Go-Go Gourmet! Compete for glory in seven countries with Go-Go Gourmet: Chef of the Year! Go-Go Gourmet: Chef of the Year: 7 different countries, mini-games, 7 printable recipes. • Hard Drive: 806 Mb. Foodie Fun Bundle – 5 in 1 – это увлекательный сборник Ваших любимых кулинарных игр в жанре “Time management”. Go-Go Gourmet: Chef of the Year.